The church offers four adult Sunday school classes and one weekly Bible Study. This class meets at 9:15 every Sunday morning. The lesson follows the International Sunday School lesson with different topics from the Bible. The topic for this quarter (through August 26, 2018) is “Justice in the New Testament.” We try to apply the scripture lesson to our daily living. Everyone age 18 and older are welcome, however, our present group has an average age in the 70s. The Adult Sunday School Class II meets at 9:15 every Sunday morning in the classroom adjacent to (East of) The Gathering Place. While those attending right now are mostly senior citizens, we invite anyone who is interested in studying the Bible to become a part of the group. We are using the International Sunday School material as published by the United Methodist Church. The weekly lessons come from both the Old and the New Testaments with scripture references that cover important issues of that time and for us today. It doesn’t matter whether you know a little or a lot about God’s Word. Come and we will learn together. The Pastor’s Sunday school class meets every Sunday at 9:15 in the northeast corner of The Gathering Place. Those in attendance are of a wide range in ages. The class is a very informal, discussion based format. Beginning in August the class will begin looking at the New Testament books of 1 Timothy, 2 Timothy, and Titus. Everyone age 12 and up are welcome. Small Group Sunday School meets at 9:30 am every Sunday. It is for men and women that want to have a conversation/discussion of our everyday life challenges and praises. Discussions remain confidential and those age 21 and up are welcome to join us. Pastor Roger offers a Monday morning Bible study beginning Monday, September 10. 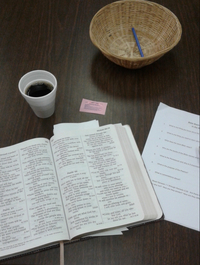 The study is held almost every Monday morning from 10:00 to 11:30 am. In September the group will resume “Bible Basics.” The group is currently looking at the four Gospels – Matthew, Mark, Luke, and John. The class is discussion based and is very informal. All are welcome to join. It’s not too late to get in on the discussion.